This is part of a series of posts occurring through the end of July as we track NetHope’s Disaster Preparedness Training occurring in Panama. Read the Pre-Training post here. It’s accurate to say that the kick-off of NetHope’s Disaster Preparedness Training was packed. Packed with skilled and experienced trainers, packed with useful technological information, and of course, packed with a healthy dose of advice for the 25 participants from nine of NetHope’s 56 member organizations and employees from tech partners Facebook, Google, and Amazon. The event, staged in Ciudad del Saber, a former U.S. military base near Panama City, Panama, is a large-scale training and simulation of NetHope’s Disaster Preparedness Training, designed to produce a roster of technically adept, field-prepped volunteers who can deploy when connectivity is needed in the case of a disaster. The morning was dedicated to an overview of NetHope and the general outline of the global humanitarian system, detailing facets of humanitarian work including an overview of the Emergency Telecommunications Cluster (ETC), a global network of organizations that work together to provide shared communications services in humanitarian emergencies and assisting with the simulation exercise. Sue-Lynn Hinson, one of NetHope’s disaster preparedness trainers and manager with CiscoTacOps. Participants gained a solid perspective on the demands of being in the field with a presentation by trainer Sue-Lynn Hinson, with NetHope partner CiscoTacOps, and Gisli Olafsson of the Icelandic Association of Search and Rescue. They both spoke of practical needs in the field, what they referred to as “austere environments” (think food, water, and toilet paper), as well as the emotional and physical demands required of those who deploy. “There are things occasionally that you will see that can’t be unseen,” said Olafsson, who recounted his experiences in Haiti following the earthquake in 2010. He noted, though, that knowing you are deployed to do a job that would benefit the survivors helped to keep perspective. 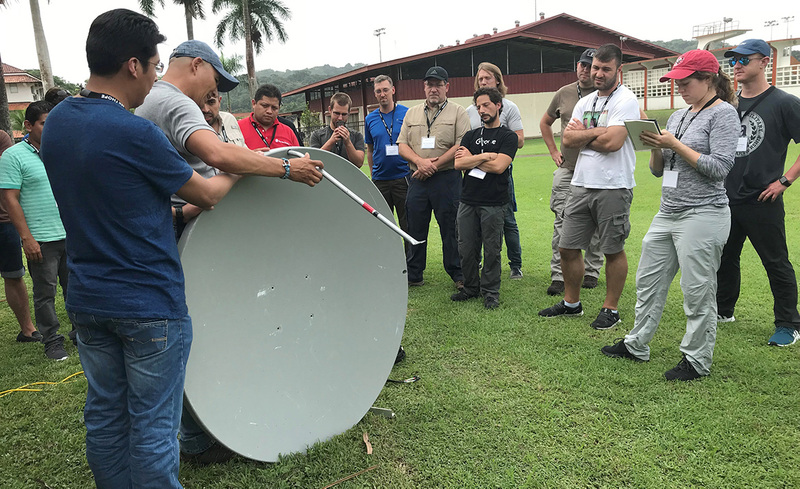 The afternoon was devoted to technical work, first a hands-on opportunity to set-up a satellite dish (pictured above), then instruction in a variety of connectivity techniques and equipment including antennae installation, Ericsson BelAir and Ubiquiti systems, and learning how to use TV White Space, a process that utilizes unused broadcasting frequencies in the wireless spectrum. The day ended with team-building exercise which helped the participants get to know each other on a personal level, an important element for successful deployment. Day Two of training will prepare participants on matters both technical and the process used for deployment until the alert comes to begin the deployment procedures at 5:00 p.m. at which time, everyone grabs their “go-bags” and they set off for…well, that is yet to come! Special thanks to The Patterson Foundation and all of NetHope’s tech partners for their financial support. You, too, can help us be prepared for the next disaster, wherever and whenever it may occur.